What an amazing autumn! We almost always have had a dusting of snow by now, or light frost. 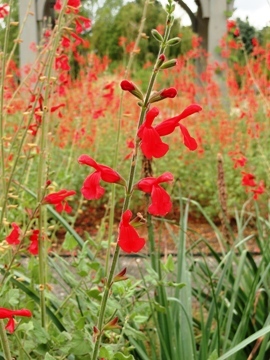 But this fiery summer blazes on, especially in the many spectacular scarlet, crimson and fiery flowers around the Gardens. You can undoubtedly tell where I took the first picture (in front of the conservatory). 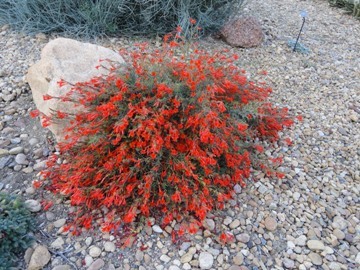 I know, I know, many botanists have flocked to lump Zauschneria into Epilobium... and they undoubtedly have ample justification. But I figure, if hummingbirds can tell the difference, so can I! 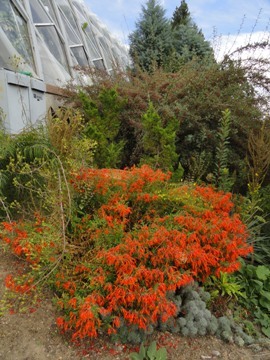 This giant burning bush from Arizona is one of the toughest xeriscape perennials and has been sold in Denver for decades, but you rarely see it. Of course, many years it gets frosted just before it reaches maximum conflagration, but not this year! Better mosey on down and check it out (bring your sunglasses to protect your eyes!). This little honey is South African, and no...Mike Kintgen does not believe it is hardy (he lifts the bulbs before hard frost): but what a spectacle this magnificent Amaryllid makes in the South African Plaza! I have seen Brunsvigia and Haemanthus in South Africa, where they can color the landscape for miles. Won't it be just peachy if we can eventually find some hardy ones to grow permanently outdoors? One of these days the frost will come and extinguish all these flowers for the season: but not yet! Hurry on down and warm your eyes with the last best blazing colors of the season. 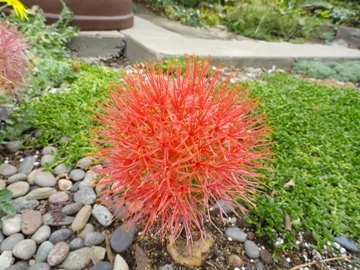 When your hot, you're hot, and let me tell you Denver Botanic Gardens is still ablaze with color!